A special called stockholders meeting of the LaRue County Fairgrounds was held at 7 p.m. tonight (4/4/19) at the fairgrounds. 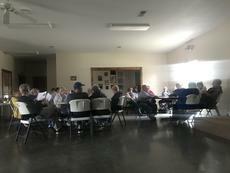 Stockholders, fair board members and members of the community gathered tonight for a special called stockholders meeting of the LaRue County Fairgrounds. Those in attendance, sat in the dark, as the building electricity has been turned off. A large crowd of stockholders and fair board members and members of the community sat in the Morrison-Phelps building in the dark, as the electricity has been shut off to the buildings. After a lengthy debate of past and current management of the fairgrounds, a motion was made to ‘lock the gate, turn off the electric and the water’. The motion also included looking into other entities that might be interested in the property going forward. As of tonight's meeting, there will not be a LaRue County Fair in 2019. The fair is the longest continuously running fair in Kentucky and 2019 would have mark their 112th year. Efforts are being made to arrange for a 3 or 4 day 4H, FFA, and Open show for those wishing to compete at the State level, but no details were finalized tonight. A 'pass the hat' effort was made tonight to pay the 2017 and 2018 Hodgenville City Taxes, and anonymous donor has agreed to pay the Fair's 2018 County Property taxes. The 2017 taxes were not paid, and was sold last August of 2018, therefore placing the fair into a 'lien on property' situation. A special meeting of the stockholders will be held at Hodgenville City Hall at 6 p.m. Thursday, April 11, to continue the conversation on the future of the fairgrounds.